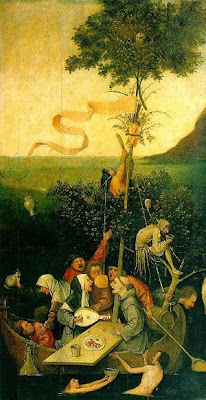 The Dreamers Disease by Trampabel: What have been the changing roles and representations of the fool in art? What have been the changing roles and representations of the fool in art? This was the title of my essay. 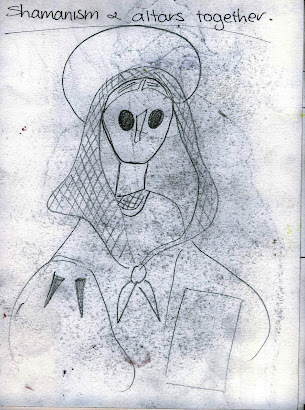 Here are some extracts and images from this essay. What is the definition of a fool? The Collins dictionary defines the fool as 1. Silly, empty-headed person 2. Dupe 3. Simpleton or 4. Jester, clown. The fool is a rich and complex archetype and draws on all these definitions. This label, like the sign in semiology has many variations and lives in the collective imagination or unconscious. 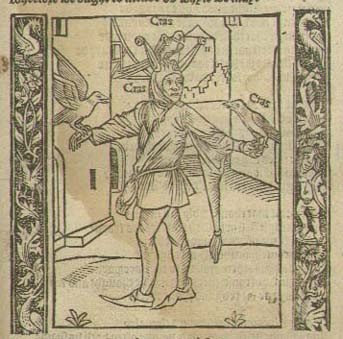 One variation of this title is the fool as a symbol, used to represent the follies of mankind. To discover what are the changing roles and representations of the fool in art I have looked at the following artists and examples of their work The Ship of Fools by Bosch The dwarf Sebastian De Morra by Velázquez, Beggarman, blind man, thief by Donovan, Liberty brothers permanent daily circus by Charles, these five images ranging from the 15th century to the present day. Examining the fools costume and it’s symbolism in images, that has developed from a contemporary dress in the 15th century of the fool performer in art, to its historical referencing in contemporary art. Also the fools depiction in images as a symbol for the follies of mankind, drawn on by artists from the popular satire of immorality from the poem; Das Narrenschiff. The historical, religious and political context of the fool is his place in the hierarchy of the court structure and his outsider status. The categories of fool are innocent, clever, trickster and performer personalities, all these categories add to the rich symbolism and associations we have of the fool. Artworks reference the fool as a character with qualities associated with the various types. The fool archetype seems to belong to the male gender and raises the question, Why are women not associated with the fool character? And is this because of gender differences? or something in the unconscious? The representations of the fool has not changed much over time the man in society can become a fool if his actions and activities are unacceptable and therefore can be amusing and stand for the folly of men that seems to about respectability, hierarchy status and power. Although there may be expectations to the rule, a man can refer and believe a man to be a fool while you would rarely hear a woman be referred to as a fool, especially by a man. It is also rare to see a woman performing a fool. Check out the British artist Cecil Collins - lots of images of the Fool. Also Jung said some interesting things about fools - one of the Archetypes. Great writing! Maybe you could do a follow up to this topic?! ?